I have two gaming groups, both of which will be playing in Exploration Age. Originally, when I asked them what they wanted to see in the world, one player suggested that the two groups work for rival adventurer’s guilds. He also suggested we do the occasional megasession with both groups racing to get the same artifact or teaming up to defeat a greater foe. Now, I’m not married to that idea, especially since megasessions are quite unwieldy and difficult to DM, but two groups of rival adventurers’ guilds seemed an awesome addition to the world! The parties won’t be forced to join one or the other, but the options and perks will be there for them. Dungeons and Dragons has always played upon the dichotomy of good and evil, but there is the lesser explored dichotomy the game also encourages. It is one of law and chaos. In Exploration Age, The Explorers’ Guild is chaotic and freeform, with just enough rules to keep the money and jobs flowing into the organization. The Society of Seekers is more structured and has better definition to rules and regulations for its members. In their eyes, a job well done is better than a job that’s done by any means necessary. My last post spoke about The Explorers’ Guild. I also mentioned The Society of Seekers in that post and now I’d like to show you a bit more of that organization now. Shouldn’t we have some heroic music or something? The Society of Seekers was started when a group of Explorers’ Guild mercenaries began to tire of the The Guild’s reputation as a group of merciless thugs who could get any job done, no questions asked. The Guild had some corrupt leaders and no standard structure from chapter to chapter. They thought the organization was one of braggarts and bullies, and the loudest thugs got the best contracts. They didn’t like that a mission accomplished by adventurers breaking laws and piling up damages and bodies received the same reward as a meticulous, legally sanctioned operation. It seemed Guildmasters were chosen for their popularity rather than merit. So these adventurers left The Explorers’ Guild and started their own organization. For fifty years the two organizations coexisted in a tense environment, always trying to beat each other out for the biggest contracts. Soon, patrons realized they could contract both organizations for a job and pay the one who completed it, doubling the chances their quest would be fulfilled. The two organizations were so anxious to beat the competition, they gladly engaged in these missions to prove the other unworthy. As the competition between the two organizations grew, so did their hate for one another. Jeers turned to practical jokes which turned to violence. Parties sent on the same mission would attack one another to ensure only their organization could fulfill the contract. It’s unclear who struck the first blow, but the two eventually took their feud into the streets of Findalay and Parian’s cities. A bloody, international gang war began. During the time of this war, many patrons took advantage of the two organizations’ hate for one another to drive their contract prices down. This did not help quell the war. The worse things became the better the deals were for the patrons, ensuring a cycle of violence. Then, almost fifty years after the feud turned bloody, The Plague of Undeath ravaged the land. Death knights, lead by Aeranore’s Highest Councilor Mage, a gnome called Fletcher Correll, used the undead to cut down a part of the king’s army. With the help of the rest of The High Council of Mages, he then used the slain to create an army of undead. Fletcher desired a kingdom just for his gnome brethren and was determined to carve one out in Findalay. Other nations came to Aeranore’s aid, but every soldiers death added to the ranks of undead. Something had to be done before all fell to The Plague. The Society of Seekers and The Explorers’ Guild held their first ever summit. They called a truce and settled terms in The Finders’ Treaty, which lays out the rules for the two guilds’ relationship and interactions. The Treaty signed, the organizations came together to stop Fletcher Correll. Today, that begrudging peace has lasted almost 100 years. The two organizations don’t always get along and still compete for business, but at least they aren’t knifing each other. Undead. For when you need a common enemy. So what’s exactly in the treaty? Members of The Explorer’s Guild and The Society of Seekers shall not take up arms against one another. If the two organizations compete for a contract, the one first awarded the contract by a patron is the only party allowed to pursue that contract. The second party must decline any offers made for the same job. Once a year, the Finders’ Festival is held in Aeranore and it is a chance for leaders to come together and discuss any problems and come to solutions. Members of either organization are welcome to attend and partake in revelry and physical and mental competitions that put the organizations on opposed teams. Those who disobey the tenets set forth in The Finders’ Treaty will be removed from the organization and pending the offense could be charge a hefty fee, publicly shamed, or put to death. The Society of Seekers has a slightly different contract than the The Explorers’ Guild. Patrons pay 50% upfront and the other half when the job is complete. Patrons may give up to ten specific parameters for any reason in a contract. (e.g. do not torture any suspects, use no lethal force, let no one outside The Society know of your mission, etc.) For each parameter broken during the contracted job, the patron will be given a 5% or more discount off the original fee. Patrons are guaranteed direct contact with The Society party contracted to them. If they so choose they can help oversee the operation with the local Society Baron. A patron can hand pick a Society party of their choice. The Society of Seekers takes personal responsibility for any mishaps during a contracted mission. They will pay for damages of goods and people they were meant to protect in the unlikely event of such a thing. At any time for any reason, a patron can request a new party be put on the contract and that request will be honored. The Society of Seekers will replace a dead or otherwise incapacitated party of adventurers if the contract can still be fulfilled at the time of death or incapacitation. Patrons are guaranteed rigorously tested, experienced adventurers working on their contracted job. At anytime, for any reason, a patron can break contract and ask for his or her upfront 50% back. The Society of Seekers was founded partly because its original members believed the Guildmasters of the Explorer’s Guild held too much power. There own structure is, of course, different. At the head of The Society is a President which, similar to High Guildmaster, is a yearly elected position. However the President does not work alone. He is part of the Top Executive Board which includes a Vice President, Treasurer, Parliamentarian, Secretary, and Registrar. All of these positions are annually elected. Each country has a chapter with a similar setup, though the President and Vice President position are the Governor and Lieutenant Governor. In local chapters these positions are Baron and Under Baron. The board runs the operations of their respective territories and are answerable to the boards above them. The Society of Seekers has Parliamentarians within their boards to help them amend and change their rules should the need arise. At-large members can also ask for recall elections of board members if 50% or more of the overall membership for the required region asks for it. Being on the executive board is a mark of pride for many members of The Society, but it also comes with the perk of payment. Whenever a contract is completed by The Society the Top Executive Board gets 10% of the contract, the country’s board gets 10% and the local board gets 10%. The boards take their pay and pay the bills out of this debt. The adventuring party who completed the job gets the remaining 70%. However, if that party ignores or breaks one of the patrons parameters or damages property for which The Society is responsible, that penalty to the organization comes directly out of their pay (see above). Likewise, if the party is deemed to have done an excellent job, broken no parameters, and followed all the local laws and customs pertaining to the mission, the executive boards only take 5% each and the party gets 85% of the contract’s reward for themselves. Thus the party is encouraged to follow the rules within the contract and the law of the land. Joining The Society of Seekers requires proof that an adventurer has completed a life-threatening mission (usually in the form of a recovered relic or a letter of recommendation from a former patron), a letter of recommendation from a member of The Society of Seekers, and a thorough interview process held during a formal dinner with a local executive board. Every member must renew membership annually, by meeting with the Registrar of their local chapter and proving with official records they have completed at least one contract for The Society. At anytime an executive board can review a member’s status in the organization and force them out of The Society for misconduct or negligence. A member can appeal this decision by taking it to the board above the board which made the decision. For the most part, The Society of Seekers holds themselves in high regard as courteous, clean, and chivalrous. This doesn’t mean that The Society doesn’t know how to have fun or see its fair share of corruption. After all, they were involved in a years-long gang war that cost many innocent lives. For adventurers in The Society, there are benefits other than pay and easy access to jobs. Like The Explorers’ Guild they always have a place to stay in any settlement with a Society House, and have their mundane expenses, room, and board paid for when on a mission. Any items acquired while not on a mission that are not specified in the contract are the adventurers to keep. A big benefit that is not an official practice of The Explorers’ Guild is The Society House Shop. Found within any Society House, the items purchased here is 20% off. The mages on hand usually have a few common consumable magic items and given a day or two can create a less common potion or scroll. In its storied history, The Society has accomplished much. Here’s a few highlights. 231 FF – The Society of Seekers uncovers the famed Ruins of Eloga and the technology discovered is used to power airships. 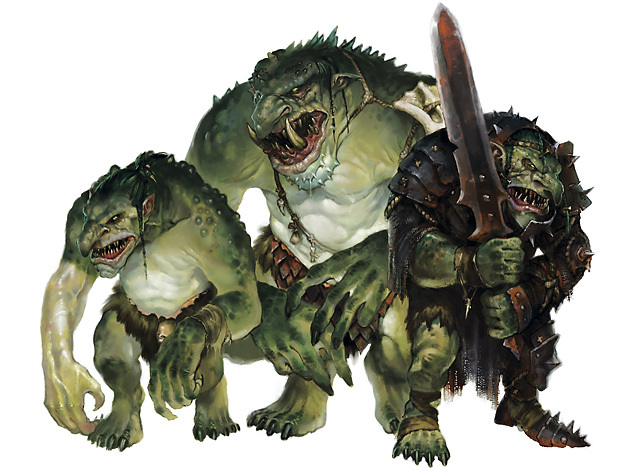 257 FF – The Society of Seekers lays waste to the army of Vrelock the Troll King who threatened the isles of Marrial. 305 FF – In rare team-up with the The Explorers’ Guild, the two organizations put aside differences and turn the tide of The Plague of Undeath and hordes of undead armies. 397 FF – The Society of Seekers is the first to explore and discover ruins within The Damned Lands. « Explorers' Guild	» Round Table 8 is up! Welp. I know which of these groups I prefer. Reblogged this on The Muses Guild:THE ARGENTA. One idea as an alternative to the “mega sessions” (I agree, those get so crazy big and unwieldy…get into a fight and you need to bring a novel with you to read because you can finish a whole chapter between turns), you could try writing out two separate but tandem storyline missions for the different guilds. They would have totally different ultimate goals, but because of location or NPCs involved along the way, they do connect…and run the adventures such that the actions of one group would impact the other group’s adventure. If you run each team every other week for the duration of the two stories, you would have a week to absorb the actions of each team and brainstorm on what they did and how it could impact the others. awesome ideas here that I’m definitely using for my campaign!